Ms. Mercedes Blason Aguilar is a strong and compassionate family law advocate for our clients. She has been practicing law since 2004 where she practiced family law litigation in Miami-Dade County, Florida and has been representing northeast Florida families since 2016. Having been born in Havana, Cuba and raised in Miami, Florida, she is fully bilingual in English/Spanish. She earned her Bachelor of Arts Degree from Florida International University, Miami, Florida and her Juris Doctor degree from St. Thomas University in Miami, Florida. Ms. Blason Aguilar has her own family and enjoys spending time with her husband, their 3-year-old daughter and two Jack Russell terriers: Bu and Gigi. In her time away from the office, she enjoys traveling, hiking and running. 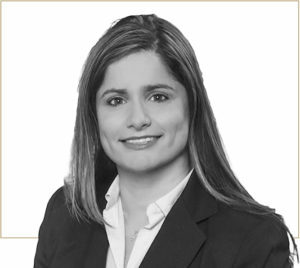 She is a member of the Family Law section of The Florida Bar, serves on the Judicial Relations Committee and Hispanic and Latino Interests Committee of the Jacksonville Bar Association and is an active member of the Jacksonville Women Lawyers Association. Additionally, she is a member of the Florida Family Law American Inns of Court (FFLAIC).